The Lunar New Year or Spring Festival but commonly known in the U.S. as Chinese New Year takes place on Tuesday, February 5, 2019, and it is the Year of the Earth Boar or Pig. The Boar/Pig is the twelfth sign in the 12-year cycle of the Chinese Zodiac. Those born in the years 1923, 1935, 1947, 1959, 1971, 1983, 1995, 2007, 2019 are characteristically diligent, compassionate, and generous. Those born in the Year of the Earth Boar are also said to be more communicative, popular among their peers, and have a good sense of timekeeping. Based on Feng Shiu, lucky colors in 2019 are yellow, red, and white. The Lunar New Year is one of the most celebrated holidays in Asian culture and growing in popularity. It is celebrated with lucky symbolic foods, family reunions, and time spent with friends and loved ones. 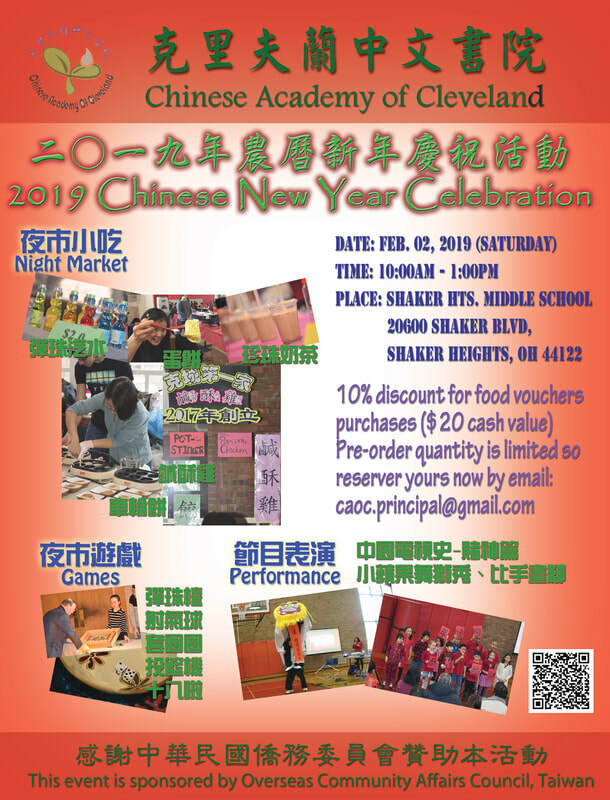 Saturday, February 2nd, 10-1 p.m. CAoC Chinese New Year Celebration 農曆新年慶祝活動, Chinese Academy of Cleveland, Shaker Heights Middle School, 20600 Shaker Blvd., Shaker Heights, Ohio. Sponsored by Overseas Community Affairs Council, Taiwan. Games 夜市遊戲, Teachers and Students Performance 師生節目表演; Night Market夜市小吃. 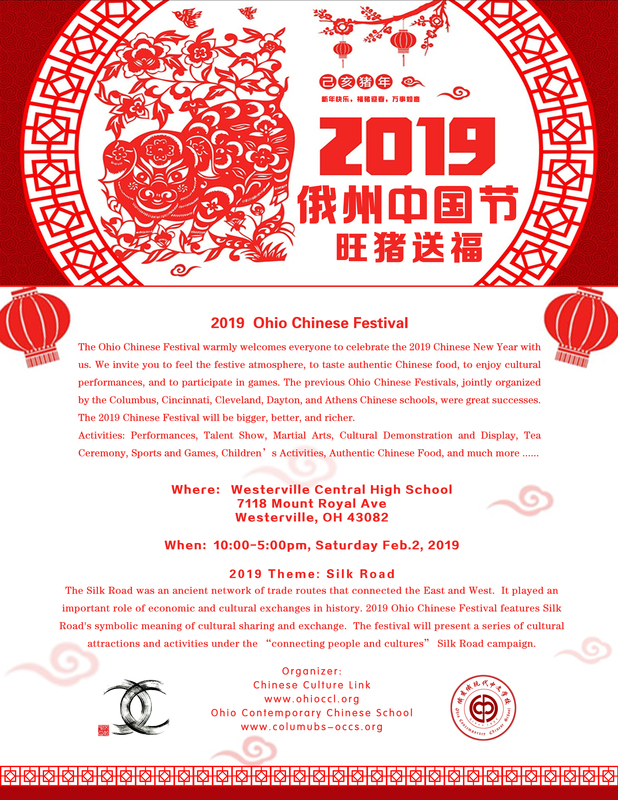 Saturday, February 2nd, 10-5 p.m. 2019 Ohio Chinese Festival, Westerville Central High School, 7118 Mount Royal Ave, Westerville, Ohio. Free Admission and Free Parking. For more information, click HERE. Saturday, February 2nd, 11:30 a.m. Ball Ball Waffle Lunar New Year Pop-Up, Asia Plaza, 2999 Payne Avenue, Cleveland, Ohio. Saturday, February 2nd, 1 p.m. Year of the Pig, Chinese New Year with the Kwan Lion Dance, Pearl of the Orient, 19300 Detroit Ave., Rocky River, Ohio. For reservations, call 440-333-9902. Saturday, February 2nd, 5-10 p.m. 2019 OCA Pittsburgh Lunar New Year Banquet, Heinz History Center, 1212 Smallman St, Pittsburgh, Pennsylvania. Saturday, February 2nd, 7:30 p.m. OR Sunday, February 3rd, 2 p.m. Beijing Dance Theater, Ohio Theatre at Playhouse Square, 1501 Euclid Ave, Ste 200, Cleveland, Ohio. For more information, call DANCECleveland at 216-241-9000 or dancecleveland.org Use code: FACE and receive $5 off each ticket! Tickets start as low as $20. Sun. February 3rd, 12 noon Lunar New Year Year of the Boar: Kwan Lion Dance & OCA Dragon Performance (1 p.m.), Asian Town Center, 3820 Superior Ave. E, Cleveland, Ohio 44114. FREE Tai Chi 3:30-5 p.m. FREE and Open to All! Free Parking in parking lots A, B, & C, at E. 38th and Superior Avenue. Get there early and have lunch at Meiga Korean BBQ on the 2nd Floor or grab a quick bite in the Asia Food Cafe. Sunday, February 3rd, 2 p.m. Chinese New Year’s Dancers, Lakewood Public Library, 15425 Detroit Avenue, Lakewood, Ohio. Yin Tang Dance Company will present a series of traditional and fusion Chinese dances. Sunday, February 3rd, 2-3:30 p.m. Chinese New Year Concert w/Jarrelle Barton, Cleveland Chinese Music Ensemble, Hudson Library & Historical Society, 96 Library St, Hudson, Ohio 44236. Monday, February 4th, 6-8 p.m. Chinese Calligraphy for Adults, Maple Heights Branch – Large Meeting Room. Monday, February 4th, 7 p.m. Lunar New Year Eve with the Kwan Family Lion Dance Performance, Li Wah Restaurant in Asia Plaza, 2999 Payne Ave., Cleveland, Ohio. Reservations Required, call 216-696-6556. Tuesday, February 5th, 7 p.m., CWRU’s 2019 Lunar New Year celebration, Tinkham Veale University Center. Fireworks will begin outside at 8:00 pm. Tuesday, February 5th, 7:00-10:00 p.m. MotivAsians For Cleveland at the NBA Chinese New Year: Cavs vs. Celtics! Quicken Loans Arena, 1 Center Ct., Cleveland, OH. Thursday, February 7th, Celebrate the Chinese New Year, Crestview Branch, 1575 SR 96 East, Ashland, OH. (Grades 4-12) Chinese New Year is China’s most important holiday. Celebrate with us as we spotlight the year of the Pig. Friday, February 8th, 7 p.m. Lunar New Year with the Kwan Family Lion Dance Performance, Li Wah Restaurant in Asia Plaza, 2999 Payne Ave., Cleveland, Ohio. Reservations Required, call 216-696-6556. Saturday, February 9th, 10:30 -11:30 a.m. Chinese Storytime, Beachwood Branch – Meeting Room (Auditorium). Join us for stories songs and rhymes in Mandarin Chinese and stay for a craft and playtime after! Presented in cooperation with the Chinese Language and Culture Center. Saturday, February 9th, 11 a.m. Lunar New Year with the Kwan Family Lion Dance Performance, Li Wah Restaurant in Asia Plaza, 2999 Payne Ave., Cleveland, Ohio. Sorry, no reservations accepted; First come, first served. 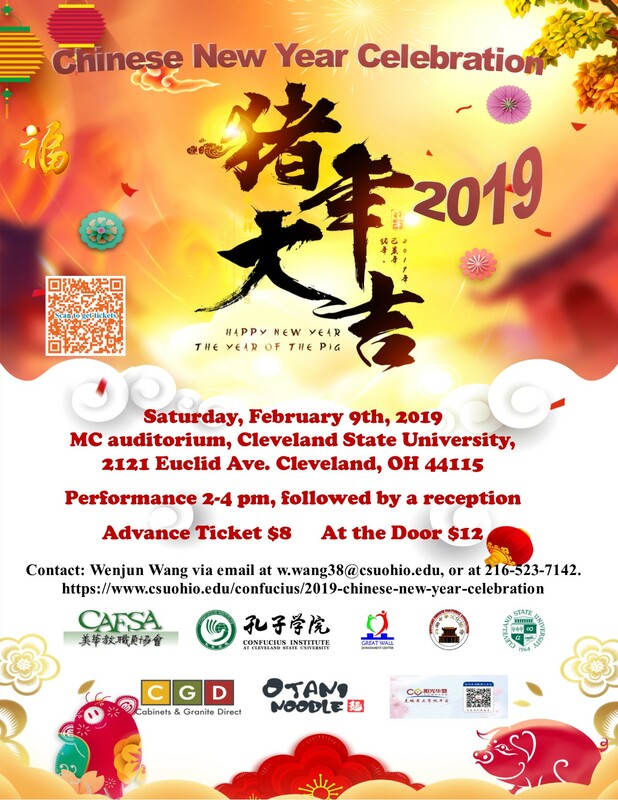 Saturday, February 9th, 2:00-5:00 p.m. 2019 Chinese New Year Celebration, Cleveland State University, Main Classroom Auditorium, Cleveland State University, 2121 Euclid Avenue, Cleveland, OH. 2-4 p.m. Celebration; 4-5 p.m. Reception. Advanced tickets $8; At the Door $12. Saturday, February 9th, 3:30 p.m. Kwan Lion Dance Performance, House of Hunan Fairlawn, Fairlawn Plaza Shopping Center, 2717 W Market St, Fairlawn, OH 44333. Call (330) 864-8215 for reservations. Saturday, February 9th, 5:00 -9:00 p.m. Chinese New Year Gala, Westlake Chinese School. 9 am to 11 am Chinese Classes, 11 am to 1 pm Extra Curricular Activities, 5 pm to 9 pm Chinese New Year Gala. Saturday, February 9th, 7:00 p.m. Chinese New Year: Year of the Pig with the Kwan Family Lion Dance Performance, Vieng’s Asian Bistro at Crocker Park, 139 Crocker Park Blvd, Cleveland, Ohio. For reservations, call 440-871-2888. Sunday, February 10th, 1-2 p.m. Live 360 – OCA Lunar New Year Dragon Dance Team Performance at Great Northern Mall, 4954 Great Northern Mall, North Olmsted, Ohio. FREE and Open to All. Sunday, February 10th, 1:30 p.m. Chinese New Year Lion Dance at Eastern Buffet, 5703 Mines Rd, Niles Ohio. Call (330) 505-9088 for more information. Sunday, February 10th, 2 p.m. Kwan Family Lion Dance Performance, Imperial Dragon, 8310 Tyler Blvd, Mentor, Ohio. Call (440) 974-8838 for reservations. Sunday, February 10th, 5 p.m. Kwan Family Lion Dance Performance, Hunan by the Falls, 508 Washington St, Chagrin Falls, Ohio. For reservations, call 440-247-0808. Sunday, February 10th, 7 p.m. Lunar New Year with the Kwan Family Lion Dance Performance, Li Wah Restaurant in Asia Plaza, 2999 Payne Ave., Cleveland, Ohio. Reservations Required, call 216-696-6556. Friday, February 15th, 6:45 p.m. Lunar New Year Celebration with the Kwan Family Lion Dance performance at Pad Thai, 5657 Darrow Road, Hudson, Ohio. Call 330-650-9998 for Dinner Reservations. Saturday, February 16th, 11 a.m. Ball Ball Waffle Pop-Up #8 & Lion Dance, Asia Plaza, 2999 Payne Avenue, Cleveland, Ohio. Saturday, February 16th, 11 a.m. Lunar New Year with the Kwan Family Lion Dance Performance, Li Wah Restaurant in Asia Plaza, 2999 Payne Ave., Cleveland, Ohio. Sorry, no reservations accepted; First come, first served. Saturday, February 16th, 4 p.m. Kwan Family Lion Dance Performance, Golden Dragon Restaurant, 5871 Mayfield Rd, Cleveland, Ohio. Call (440) 449-8710 for reservations. Saturday, February 16th, 6:30 p.m. Kwan Family Lion Dance Performance, Bo Loong Restaurant, 3922 St Clair Ave NE, Cleveland, Ohio. Reservations Required, call 216-391-3113. Sunday, February 17th, 12 p.m. Celebrate Chinese New Year with a special Kwan Family Lion Dance Performance, Dragon Gate Restaurant, 6681 W 130th St, Parma Heights, Ohio. Call (440) 743-0800 for reservations. Sunday, February 17th, 2 p.m. Kwan Family Lion Dance Performance, Imperial Dragon, 8310 Tyler Blvd, Mentor, Ohio. Call (440) 974-8838 for reservations. Sunday, February 17th, 2:30-6 p.m. Central Ohio Families with Children from China Chinese New Year 2019, Dublin Community Center (Performances on the Abbey Theater stage), 5600 Post Rd, Dublin, Ohio 43017. Chinese buffet by Joy Food One; Special Master of Ceremony: Angela An. This event is open to everyone. Invite your friends and family, and feel free to share this invitation with those who might be interested in COFCC or the Chinese adoption community. Sunday, February 17th, 5 p.m. Year of the Pig Celebration with the Kwan Family Lion Dance, Hunan Solon, 6050 Enterprise Pkwy, Solon, Ohio. Call (440) 248-8836 for reservations. Sunday, February 17th, 7 p.m. Lunar New Year with the Kwan Family Lion Dance Performance, Li Wah Restaurant in Asia Plaza, 2999 Payne Ave., Cleveland, Ohio. Reservations Required, call 216-696-6556. Friday, February 22nd, 5:30-7:30 p.m. 2019 Chinese New Year Annual Event in celebration of the Year of the Pig, Old Brooklyn Winery, at 4103 Memphis Ave, Cleveland, Ohio. Hosted by the Greater Cleveland Chinese Chamber of Commerce. RSVP HERE by 2/18. Friday, February 22nd, 6:45 p.m. Lunar New Year Celebration with the Kwan Family Lion Dance performance at Pad Thai, 3545 Brookwall Dr, Fairlawn, Ohio. Call 330-668-9981 for Dinner Reservations. Saturday, February 23rd, 10:30-11:30 a.m. Chinese Storytime, Beachwood Branch, Meeting Room (Auditorium). Join us for stories songs and rhymes in Mandarin Chinese and stay for a craft and playtime after! Presented in cooperation with the Chinese Language and Culture Center. Saturday, February 23rd, 3:30 p.m. Year of the Boar Kwan Family Lion Dance Performance, King Wah, 20668 Center Ridge Rd. Rocky River, Ohio. Call 440-331-0330 for reservations. Saturday, February 23rd, 2:00-3:00 p.m. Celebrate the Chinese New Years For families, Brecksville Branch – Meeting Room. Join eighth-grade students from Brecksville-Broadview Heights Middle School to celebrate the Year of the Pig. Learn some Chinese words and enjoy a story, a craft, and other fun activities in this introduction to Chinese culture. Register HERE. Saturday, February 23rd, 5 p.m. Kwan Family Lion Dance Performance, Golden Dragon Restaurant, 5871 Mayfield Rd, Cleveland, Ohio. Call (440) 449-8710 for reservations. Sunday, February 24th, 12 p.m. Kwan Family Lion Dance Performance, Dragon Gate Restaurant, 6681 W 130th St, Parma Heights, Ohio. Call (440) 743-0800 for reservations. Sunday, February 24th, 2 p.m. Kwan Family Lion Dance Performance, Imperial Dragon, 8310 Tyler Blvd, Mentor, Ohio. Call (440) 974-8838 for reservations. Sunday, February 24th, 4 p.m. Kwan Family Lion Dance Performance, Golden Dragon Restaurant, 5871 Mayfield Rd, Cleveland, Ohio. Call (440) 449-8710 for reservations. Sunday, February 24th, 6 p.m. Kwan Family Lion Dance Performance, Imperial Dragon, 8310 Tyler Blvd, Mentor, Ohio. Call (440) 974-8838 for reservations. Friday, March 1st, 6:30 p.m. Chinese Year of the Pig 2019, 10-Course New Year Feast, Li Wah, Cleveland, Ohio. $50/person, Reservations/Payment by 2/22 to the Bratenahl Community Foundation. Sunday, March 3rd, 12:30 p.m. Kwan Family Lion Dance Performance, China Jade Restaurant, 2190 Brookpark Rd, Cleveland, Ohio. Call (216) 749-4720 for reservations. Sunday, March 3rd, 4 p.m. Kwan Family Lion Dance Performance, Golden Dragon Restaurant, 5871 Mayfield Rd, Cleveland, Ohio. Call (440) 449-8710 for reservations. Sunday, March 3rd, 6 p.m. Kwan Family Lion Dance Performance, Imperial Dragon, 8310 Tyler Blvd, Mentor, Ohio. Call (440) 974-8838 for reservations. Have a Lunar New Year event that’s not listed here? Submit your event to president@ocagc.org or message OCA Greater Cleveland on Facebook, Instagram, or Twitter. To book the Kwan Lion Dance, send an email to kwanpower@sbcglobal.net or visit their Facebook page. To book the OCA Cleveland Dragon Dance team for larger venues on weekends, message us at OCAdragon7@gmail.com. Pledge to Vote in the Nov. 5th Election! Crazy Rich Asians #GoldOpen because AAPI Representation Matters! OCA Greater Cleveland updated their cover photo. OCA Greater Cleveland is at Carl B. Stokes United States Courthouse. OCA Greater Cleveland is at Cleveland International Film Festival.